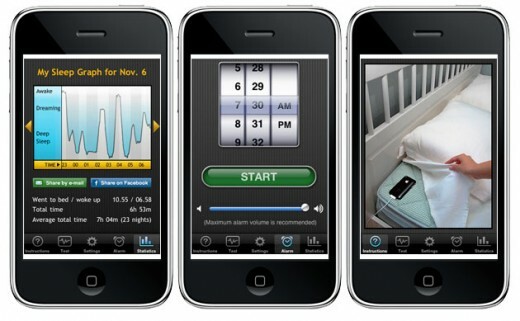 Sleep Cycle – Turn Your iPhone Into a Sleep-tracking Device. If you’re like me, waking up in the morning can be challenging. Hearing my loud alarm go off in the AM sometimes scares me to death and other times I can’t hear it at all. So how can this problem be solved? There’s an app for that! Sleep Cycle is a Swiss-made iPhone app that offers a new approach to the way we wake up. During the night, we drift back and forth between light and deep sleep cycles; the key to feeling rested and relaxed is to wake up during the light sleep phase. The Sleep Cycle App claims to be able to help you do just that. Placed under your pillow, Sleep Cycle uses a sensor called accelerometer that lets your mobile device track your movements throughout the night. Since your movement during sleep varies between the different stages of sleep, Sleep Cycle is able to track what stage of sleep you are in. As you approach the light sleep phase it will gently wake you up. It even lets you use your own mp3 music as a wake up tune. Just remember to charge your phone during the night as the app is constantly working and may drain your battery. Do you use Sleep Cycle already – tell us how well it works for you. Author aserokinPosted on June 8, 2011 May 21, 2014 Categories Alarm Clocks, Better Sleep, Uncategorized10 Comments on Sleep Cycle – Turn Your iPhone Into a Sleep-tracking Device. Puzzle Alarm Clock – An alarm clock that shoots puzzle pieces in to the air as the alarm goes off; in order to silence the alarm, you have to reassemble the puzzle on top of the alarm clock. Clocky – Developed by MIT Grad Student Gauri Nanda, this alarm clock takes the old principle of “move the alarm clock to another part of the room so you have to get up to turn it off” to a whole new level. As the alarm goes off, Clocky rolls away to a new [random] location, so not only do you have to get up to turn off the alarm – you also have to find it! Blowfly – Taking the “you need to catch me first before you can silence me” concept one step dimension further, Blowfly doesn’t roll away when the alarm goes off. Nope, Blowfly, as the name implies, flies away from its base when the alarm goes off. Silencing the alarm, as you may have guessed, requires catching the Blowfly and returning it to its base. Nintendo Controller Alarm Clock – This alarm clock is designed to resemble an original Nintendo controller. The alarm has a Super Mario Brothers tone, but if you score high enough in the alarm clock’s built-in game, you can unlock a ‘secret’ alarm tone. Also, if you ever wondered just how a traditional alarm clock works, Howstuffworks has a pretty informative article.